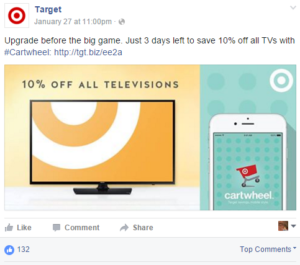 A call to action is a marketer’s best friend, especially on social media. What’s the point in creating great content if you don’t actually encourage people to use it? A ‘call to action’ is exactly what it sounds like: a ‘call’ for people to perform some ‘action’. This can come in the form of ‘sign up now’ buttons on websites or, on social media, taglines urging people to click on the links you’ve provided. To break it down, calls to action convert users into a leads, with the potential of that lead becoming a customer. And above all, you’re bringing people to your website. Calls to action are important in marketing campaigns because they create a sense of urgency for the potential customer to act now. Without them, your content is just an idea, and without leading people to take that extra step, they’re not likely to act at all. The best calls to action are direct and straightforward, though there’s lots of wiggle room to get creative. ‘Book your cruise now.’ ‘Share this post.’ You can even make things interesting by adding an incentive: ‘Buy now and save 50%’ or ‘Retweet for the chance to win.’ Most importantly, your call to action needs an imperative verb: ‘click’ or ‘order’ or ‘sign-up.’ Something the consumer can instantly do, instead of just think about. This might seem like a no-brainer, but the absolute, most important thing to include in a call to action is the action. You are directly telling people what you’d like them to do with the link you’re providing, in hopes that they will do it. 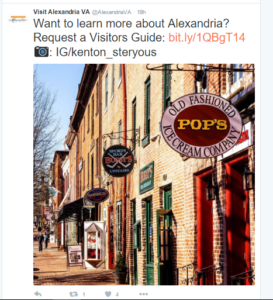 The people at the City of Alexandria, Virginia would like those perusing their Twitter feed to request a Visitors Guide so they can find out more about the city of Alexandria and potentially come over for a visit. Sound simple? That’s because it is! Nobody wants to feel like just another face in the crowd, especially on social media. That’s why speaking directly to your customers as ‘you’ or ‘your’ makes it seem like you aren’t just shouting out a blanket statement into the void. Sainsbury’s call to action specifically addresses the consumer with ‘you’ to let them know just who they’re asking to perform this certain task. It gets the reader thinking about the question posed, and how it relates to them, making the call to action feel more personal. The American brand Target’s call to action below combines both timeliness (they’re urging people to purchase new televisions in preparation for the upcoming Super Bowl) and urgency to get people to buy within the next three days, before the 10% deals expire. Not tomorrow, next week, or next month. Providing people with a time frame makes it so that they aren’t left endlessly mulling over their options. Adding words like ‘now’ and ‘today’ at the end of your call to action also helps to create the feeling that the consumer will need to act sooner rather than later, and that the pay-off of this specific action is immediate. 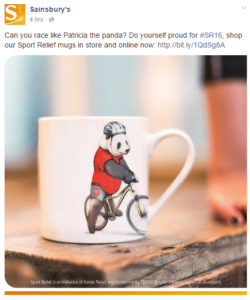 The use of a shortened URL also allows users to easily to share the link across social media – users just need to type that short link to share it with their friends. 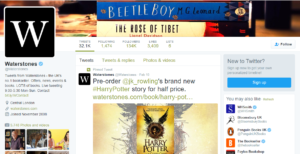 Okay, so not every campaign is going to be as easy as convincing Harry Potter fans to buy the new J.K. Rowling book, but the idea here is that calls to action can (and should be) short, sweet and uncomplicated, especially on platforms like Twitter, where characters are limited. You don’t necessarily need to dilute your message with gimmicks and explanations, just a straightforward action you’d like people to perform. 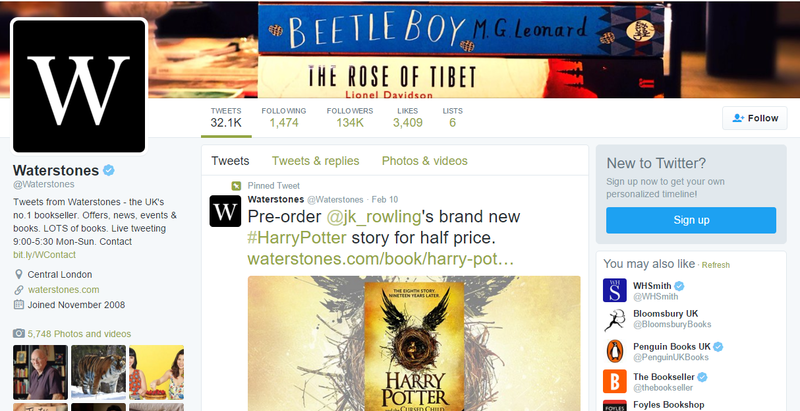 Here, Waterstones is simply urging people to ‘pre-order’ the brand new Harry Potter book for half price, coupled with a photo of the book cover to get them excited. It’s easy and successful. Everybody loves a little added treat – and if people are going to get something extra (even if it’s just hypothetical savings they wouldn’t get from booking or buying on another site) if they follow your call to action, say so! 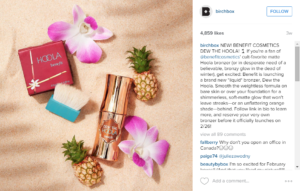 If you follow the link and sign up for Birchbox, you’re going to receive an exclusive bronzer ahead of the crowds. Those customers who were on the fence before might teeter more readily onto your side if they know up front what they’re going to get and what you can do for them. And if something is free to do—ie ‘our free giveaway’ or ‘our free-to-enter contest’—shout it from the rooftops. Not seeing conversions from your calls to action? We can help you craft the perfect marketing message, so your readers become customers – just drop us a line to find out how.